They have Gift Baskets for Any and All occasions - Mother's Day, Father's Day, Appologies!, Weddings, Seafood baskets, Holiday, Baby Gifts and MORE . . . they even have CHOCOLATE LOVER'S baskets! Oh My! Want to know more? or see what all they have to offer? 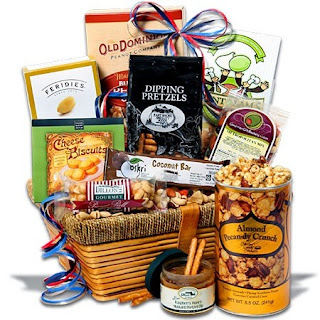 Then check out their website for the full list of all their Gourmet Gift Baskets and more. When my Gourmet Gift Basket arrived, I had my three children sit down at the kitchen table with me - poor daddy missed out since he was at work, but the kiddos and I just could not wait to taste test everything inside the beautifully wrapped basket! As I prepared the table, the kids and the basket - I thought to myself, this is so much fun! Almost like a mini indoor picnic! I wonder how many people received these Gourmet Gift Baskets and truly take the time to enjoy them? Anyway, my kids were a bit impatient and wanted to dig right in. I made them wait so I could take pictures of all the items in the basket - write them all on paper, then jot down our notes as we tried each item one at a time. My son, Josh was an excellent young reviewer! He would offer comments on some items after his main "like it, love it, don't like it?" comment. Alli ~ "really good" and liked "everything about them!" Very enthusiastic response. Josh ~ "pretty good" says they "taste like lemonade Girl Scout cookies"
Me ~ "good" kind of taste too citrisy for me. The "key lime" flavor overwhelms the white chocolate, but not bad. *just so you know, none of my kids like regular Honey Mustard, but I do - so it was a challenge to get them to try it at all! Lydia ~ *would not even try it - but loved the pretzels! Josh ~ "ok for honey mustard, but wouldn't want to eat it"
Josh ~ Really Good! Liked how there's just enough caramel taste and he could still taste the peanuts too! Alli ~ "not very good"
Lydia ~ "don't like it"
Josh ~ "like it pretty good"
Me ~ It is ok, but the sweetened coconut in packages at the store tastes better. This does remind me of eating fresh coconut straight from the tree though slightly sweeter. Would be good for someone who loves coconut, and convenient since it is in bar form. Alli ~ "GREAT! Better than the store ones or trail mix nuts!" Me ~ Much harder and drier than what I am used to eating. The store bought ones are easier to eat and tastes better to me. These didn't have much flavor and were hard - I didn't really care for them. Alli ~ "love it! tastes like cake with icing and nuts on it" asked for seconds! Lydia ~ "I like the cream - YUMMY" - also asked for seconds! Me ~ Tastes like a marshmallowy, sweet icing with nuts. Is too sweet for me, but those with a sweet tooth will love it! Me ~ Banana is ok, though dry and crunchy bananas are not my favorite - lol, The nuts were bland/dry, Cranberries surprisingly sweet, only slightly tart - very good (i don't usually like cranberries), pinapple and papaya were bland - Raisins also good, sweet. Alli ~ Love It! Even the Nuts! Me ~ Very Good! not too sweet, just right. Now I have to try not to eat the whole thing! The nuts are sort of candy coated - it reminds me of a sweeter version of Cracker Jacks (only without the toy prize - lol) yummy! *I received a free product from Gourmet Gift Baskets for this review. I was in no way compensated or required to post a positive review. ALL reviews are my PERSONAL opinion - see my FTC Disclosure for more info. What fun, who wouldn't want to get one of those baskets in the mail? You have some adorable helpers!